From the outside, there’s nothing special about New York City’s Robert Miller Gallery. It looks like the rest of the galleries in Chelsea that you might expect to find under the High Line—a former railroad track turned park. Yet inside, these bright white walls witnessed an unexpected birth. Who would think that the cultural elites of the opera world would mingle with the cult of Minecraft to produce a show? On May 2, it happened—an opera played out in front of Minecraft projections. The mastermind of this novel coupling is a new company, Bare Opera, which made its debut with Maurice Ravels’ L'enfant et les Sortilèges (The Child & The Enchantments), the operatic equivalent of Where The Wild Things Are and the Toy Story movies. 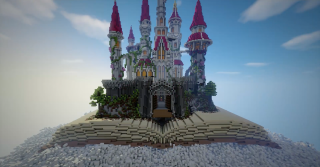 The production’s set designer, artist Alexandra Posen and director Anthony Laciura, the opera singer\butler of Boardwalk Empire fame, thought Minecraft was an ideal vehicle with which to show the story in a modern light. A still from the production. The Child & the Enchantments tells the story of a child who throws a tantrum and wrecks everything inside his house when his mother forces him to sit and do his homework. The broken objects—chairs, grandfather clocks, storybooks, and even his math homework—come to life and take revenge. They chase the child outside where things don’t get any better, as he is now in the grip of the backyard animals that he has abused for years. It is only when the boy bandages a wounded squirrel that the objects realize that the child has some good in him. It’s an opera about a fantastical world in which children both create and destroy. The Minecraft projections used in the production are equally beautiful and ominous, with pastoral scenes contrasting with lava and fire. When the child falls off a chair after his tantrum, his Minecraft avatar goes from normal size to miniature, illustrating that he’s at the mercy of his surroundings. The run, which lasted from May 2nd to the 4th, completely sold out. This was a double bill where The Child & The Enchantments came second after Debussy's L'enfant prodigue (The Prodigal Son). Intermission featured a special snack consisting of sour worms, gummi bears, goldfish, and orange soda—all items that according to Min Lew, Bare Opera’s general director, “were meant to remind the audience of childhood” before seeing the opera. Gregory Moomjy writes for New Jersey Monthly, Pro Ópera, and works for Gotham Chamber Opera. He received a Master of Science degree from Columbia University Graduate School of Journalism and a Bachelor of Arts degree in musicology at Fordham University in New York City, where he currently resides.